Nominate someone you know, or nominate yourself. 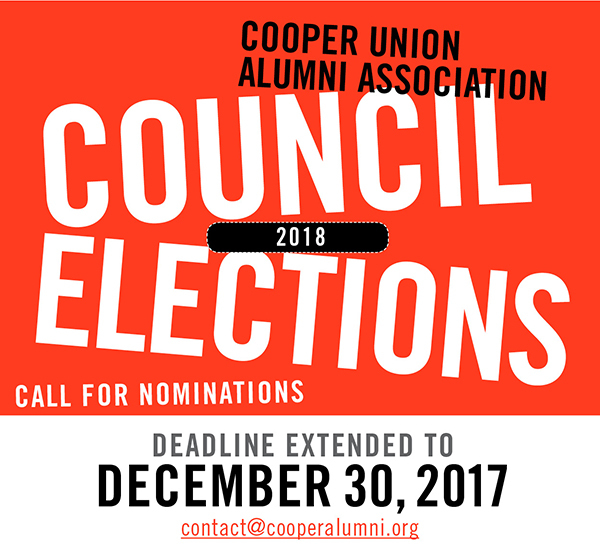 Be a part of the CUAA to continue the legacy of The Cooper Union. Contact information for both the nominee and the person nominating. Change and progress does not happen by itself. We need your support to help to get us Back to Free, run the Alumni Association, and improve alumni engagement. The deadline for nominations is December 30, 2017. This entry was tagged 2018 Election. Bookmark the permalink.